Adlai Ewing Stevenson was a lawyer, statesman, and unsuccessful Democratic Party candidate for the presidency in 1952 and 1956. An eloquent and witty speaker, Stevenson served as chief U.S. delegate to the United Nations during the Kennedy administration. Stevenson was born on February 5, 1900, in Los Angeles, California, and moved with his family to Bloomington, Illinois, in 1906. He graduated from Princeton University in 1922 and studied law at Northwestern University. He was admitted to the Illinois bar in 1926 and established a successful law practice in Chicago. By the early 1930s Stevenson had set his sights on public service, following the course of his grandfather, Adlai E. Stevenson, who was vice president of the United States during the administration of President grover cleveland (1893–1897). Stevenson joined the New Deal administration of President franklin d. roosevelt in 1933, serving as special legal adviser to the Agricultural Adjustment Administration. In 1934 he became general counsel for the Federal Alcohol Bureau. Though Stevenson returned to his Chicago law practice in 1934, he remained an active civic leader. He headed the Chicago Bar Association's Civil Rights Committee and became the chair of the Chicago chapter of the Committee to Defend America by Aiding the Allies. This committee, composed of prominent business and civic leaders, worked to overcome U.S. isolationist foreign policy and provide aid to Great Britain and France at the beginning of World War II. Stevenson rejoined the Roosevelt administration in 1941 as special assistant to the secretary of the Navy, and in 1943 he led a mission to Italy to establish a U.S. relief program. In 1945 Stevenson moved to the State Department, where he became a key participant in the establishment of the United Nations (U.N.). He was senior adviser to the U.S. delegation at the first meeting of the U.N. General Assembly in London in 1946 and was a U.S. delegate at meetings of the assembly in New York in 1946 and 1947. In 1948 Stevenson returned to Illinois and ran as the Democratic candidate for governor. He was elected by the largest majority ever recorded in the state. He proved an effective chief executive, revitalizing the civil service, establishing a merit system for the hiring of state police, improving the care of patients in state mental hospitals, and increasing state aid to public education. When President Harry S. Truman announced that he would not seek reelection in 1952, Democratic leaders urged Stevenson to seek the nomination. Although Stevenson declined to campaign for the nomination, the 1952 Democratic National Convention in Chicago drafted him as their presidential candidate. Stevenson ran a vigorous campaign but proved no match for the Republican candidate and popular war hero, General dwight d. eisenhower. Eisenhower easily defeated Stevenson in 1952 and again in 1956. Stevenson spent the 1950s practicing law in Chicago and serving as a spokesperson for the Democratic Party. At the 1960 Democratic National Convention in Los Angeles, a small group of liberals again sought to draft Stevenson for president. The effort failed and Senator john f. kennedy of Massachusetts was nominated. Kennedy appointed Stevenson U.S. ambassador to the United Nations and gave him cabinet rank. Stevenson was deeply disappointed, however, believing he was the best-qualified person to serve as Secretary of State. Despite his disappointment, Stevenson carried out his role at the United Nations with distinction. During the Cuban Missile Crisis of October 1962, Stevenson had a dramatic confrontation with the Soviet Union's delegate, telling the delegate he was prepared to wait "until Hell freezes over" for an answer to his question about Soviet missiles in Cuba. "The essence of a republican government is not command. It is consent." Stevenson died on July 14, 1965, in London, England. Broadwater, Jeff. 1994. Adlai Stevenson and American Politics: The Odyssey of a Cold War Liberal. New York: Twayne. Martin, John Bartlow. 1977. Adlai Stevenson and the World. Garden City, N.Y.: Doubleday. ——. 1976. Adlai Stevenson of Illinois: The Life of Adlai Stevenson. Garden City, N.Y.: Doubleday. Stevenson, Adlai E. 1972–79. 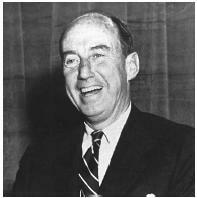 The Papers of Adlai E. Stevenson. Ed. by Walter Johnson. Boston: Little, Brown.